Since there’s been some question of how to build a simplified martial art, here’s a quick example. The Tiger Style focuses on devastating claw-hand strikes, twisting acrobatic kicks, grappling, and low, wide – and exceptionally stable – stances. It’s primary focus is close combat. 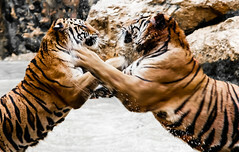 If outnumbered by his or her enemies a Tiger Stylist will close with one of them and attempt to eliminate him or her as swiftly as possible – while keeping the fight in whirl of motion so that his or her other foes will be unable to join in. It’s special maneuvers display the user’s massive power – smashing and destroying barriers, weapons, and foes, breaking bones, incredible leveraged throws, and ripping things apart – including the very earth when augmented with essence. It is one of the most primal martial arts that is still practiced in Creation. Martial Arts 3+, High Str and Dex preferred. Mysteries of the Tiger I (Ess 2): Gain Iron Hand Strike (Claws, 1), Endurance Training (Wolf’s Pace, 1), and Hardening Kata (Large, 1). Mysteries of the Tiger II (Ess 3): Gain Survival Training (Fur), upgraded Hardening Kata (Huge,+1), and Night Vision (1). Fun fact! The “Mysteries of…” charm sequence is permanent; even if you’re not using the style at the moment. Yes, that means that having Mysteries from more than one form will stack – but there’s only so much you can do with one and two point mutations. Fortunately, as charm effects, all negative consequences of such “mutations” are ignored. Initiate of the Tiger (Ess 2): Gain (Essence-2) Bonus Uses of your Martial Arts Maneuvers per day OR one bonus use of one of them in each fight (Enlightened Mortals should almost always take the per-fight option). At least one Martial Arts Excellency. Unconquered (Ability) Perfection 1 (Channel a Virtue and add +2 DC to add a thaumaturgy-level effect to your martial action). Unconquered (Ability) Perfection pretty much replaces most charm trees – which is the entire point really. Why should the amazing powers of the Exalted be confined to a relatively small selection of rigid abilities? Unconquered (Ability) Perfection 2 (Dragonblooded. Ess 3, Channel a virtue and add +4 difficulty to produce a terrestrial circle sorcery level stunt), 3 (Lunar, Sidereal, Ess 5, Channel a virtue and add +7 difficulty to produce a celestial circle effect), or 4 (Solar, Ess 8, Channel a virtue and add +10 difficulty to produce a solar circle effect). Mysteries of the Tiger III (Ess 7): Gain Eye of the Tiger (Chakra Eye) and upgrade Endurance Training to Gazelle’s Pace. Mask of the Tiger: Artifact III (Power 5, Utility 4, Plot Impact 2, Script Immunity 1 = Rating-***). 8x Class-B Powers: +2 Dex, +2 Str, +4 Martial Arts, +4 Damage, +4L/B/A Soak, Counts as a Reinforced Buff Jacket (cost 2 so Class-B) with no armor penalties (also Class-B for Class-B Armor; Net +9L/+12B), Damage Cap 5. It’s also fair enough to use this basic artifact design for pretty much any martial art form charm.